IXION WHEEL SYSTEM: Lightweight and lightning-fast skate wheels complete with custom graphics. Best of all, the wheels are easily replaceable should your bag break down on the road. MULTIPLE BOARD CAPACITY WITH LOWER BOARD STORAGE: Provides instant access to a single, un-mounted deck without having to unpack the entire bag. REMOVABLE BOOT AND BINDING BAGS: Quarantine your boots, bindings or anything that might be funky from the rest of your stuff. Also protects your precious stick from unwanted chaffing. The team’s top pick. Maximize your on-tour options with separate storage for multiple decks, removable boot and binding bags, and room for plenty more. 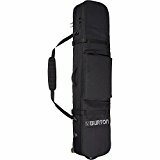 Super lightweight and built with rugged materials, the team-favorite Burton Wheelie Board Case is like Fort Knox for your entire snowboarding arsenal. Get fully padded protection for multiple decks, super smooth IXION skate wheels, and removable boot and binding bags (the bags also work great for laundry, lunch, wet stuff, anything really) all at a weight that leaves breathing room on the baggage scale.